Have a day, Patriots’ running backs! Just earlier this week, New England Patriots’ running back Jeremy Hill was talking about the difference between training camp practices and preseason games, and how he looked forward to getting into "game mode" where players actually make contact. Well, he got all of that and more in a breakout first preseason game against the Washington Redskins on Thursday night. Hill had 11 carries for 51 yards, a touchdown and two receptions for 14 yards. 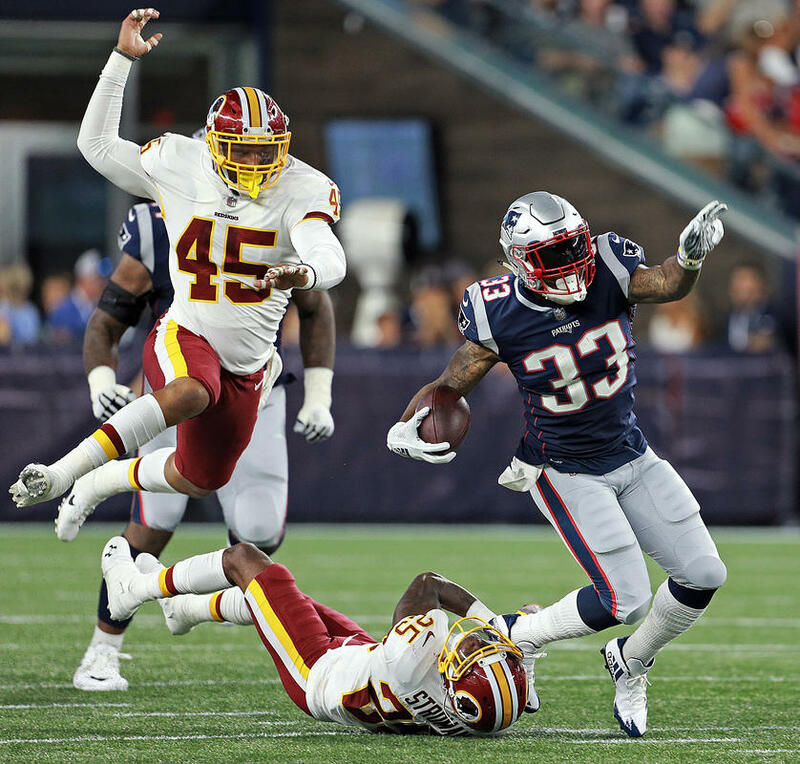 His efforts helped propel the Patriots to a come-from-behind victory to defeat the Redskins 26-17. “It felt great,” Hill said after Thursday’s game. “The big thing for me is just getting the rhythm with a new team. It's good to be out there with this team and build the camaraderie with the offense. I'm just out there competing, just trying to do my job and continuing to work. Hopefully that'll put me in the position I need to be in when the regular season rolls around. Whenever I get an opportunity I have to go out and try to play well. I can't worry about whose up or whose down. I just have to do my part." Hill had a great run with the Cincinnati Bengals before coming to New England, averaging 919 yards and 9.7 touchdowns a year over the course of three seasons with the team. He then encountered an ankle injury that required surgery to remove bone spurs and has been fighting his way back ever since. Hill is hoping to become a roster lock for the Patriots and made a very strong case on Thursday night. Another breakout running back performance came from former Vanderbilt Commodore, Ralph Webb, who stepped up in the third in fourth quarters to carry the ball 14 times for 46 yards with two touchdowns and a pair of two-point conversions.